After the first spin I didn't really know what to think of this record. 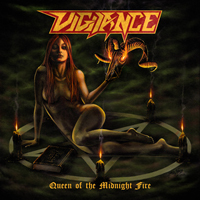 Vigilance is a metal band hailing from Slovenia and it is quite clear, which music they have been listening to lately. The entire album breaths early eighties NWOBHM on speed. The album even sounds as if it was recorded back then. If that is a positive point I don't know, I let you be the judge of that. In several songs riffs pass by that remind of early Mercyful Fate and even the little spooky atmosphere can be heard. "Speedwave" has a big Iron Maiden influence that reminds of their first album. The bass is in front of the mix and the guitars follow. The only thing that I'm not really sure of is the vocals. It really suits the music, but Jakob Rejec isn't a real steady vocalist. He sometimes sings acceptable, but at times he completely derails. I can imagine that a lot will find that it sounds a little too ancient, but on the other hand to find more old school metal than this is almost impossible. Will there be a lot of young metal fans, who will be interested in this album? I don't know, but for those between the 40 and 50 years old this is a real déjà-vu. Fans of the first albums of Mercyful Fate, Iron Maiden and Angelwitch will certainly appreciate this.